Mechanization of the distribution center (DC) has become commonplace, to the point that certain tasks are mechanized as the standard approach. Split case distribution is considered to be the most difficult of applications to mechanize. But, a Tennessee distribution center has found ways to mechanize even this. The challenge, in this instance and others like it, is in dealing with individually picked items, located in a high-density storage area, which are without individual item labeling. The items are generally non-conveyable and require use of a shipping medium like a carton or tote for picking. And there’s a need for a quality control check. These split case distribution centers also generate trash from master cartons as items are picked. 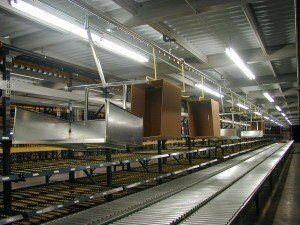 To address these mechanization issues, the Tennessee distribution center installed overhead chain conveyors. Included were a number of separate overhead conveyor systems with several thousand feet of overhead chain. The distribution center picks split case items in a high-density storage pick module that is 4 levels high for best cubic efficiency. It incorporates flow racking, which is replenished with full carton goods around its perimeter. Meantime, full cartons flow to a middle area for picking. There are side-by-side conveyor lanes in a gravity/power/gravity configuration here. Order picking begins with the generation of a picking list and a shipping label. An order picker will choose a shipping container (carton or tote) and affix the label. The containers are made available to the picker via overhead chain conveyor located above the triple-wide conveyor lanes. Operators may add a new carton or tote box from the carrier of the overhead chain conveyor as the need arises, applying the label at the start of picking, or as extra cartons are needed. As the breaking down of master cartons in the picking aisles occurs, trash corrugate is generated. As the original cartons are emptied of their contents, the operator needs to dispose of these without walking too far. Once again, the overhead chain conveyor comes to the rescue. The operator places the empty carton on a special trash carrier (tray) that is attached to the same Overhead Chain Conveyor.